But first, we'd like to wish all you moms out there a lovely Mother's Day-and that includes moms of furkids, too! Although Bella and I are Parental Unit's only kids, she feels the urge to treat herself to brunch...and so she will (sans any corsage), at the most fabulous cafe, Pistacia Vera, right down the street from us. 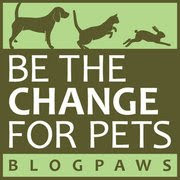 As you've noticed we're dispensing with our regularly scheduled programming this weekend (the Saturday Pet Blogger Hop and our Sunday "Living With Your Pet" tips, both of which will return next weekend. If you have a spare moment, do read our post from yesterday which shines a Broadway spotlight on the fabulous team of Annie the Broadway Musical and Pedigree, and what their partnership is doing to help shelter dogs. It also shares our interview with an amazing guy, Bill Berloni, a theatrical animal trainer with 35 years experience on Broadway, and who's trained all of the "Sandy's"for the Broadway productions of Annie. You can look forward to a series of posts on Berloni and his backstage tales (tails) he revealed to us! But right now, we've go a winner to announce! Who won a copy of this wildly interesting book by award-winning science writer, Virgina Morell? We've turned, as usual, to the Random Sequence Generator to find out. We plugged in the numbers, four through six, because the first three comments had already read the book, lived in Mexico (so sorry, Lorenza-we'll double check shipping outside of the U.S. for our future giveaways), or didn't want to enter this time. The #6 comment was posted by Kat, from the Krazy Kabbage Blog (we love your handmade yarn kitty!) 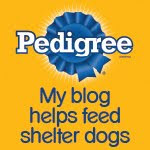 Let's all put our paws together in a round of applause for our winner, Kat! Congrats! P.S. Don't forget to enter to win one of THREE autographed copies of Paper Pups, 35 Dogs to Copy, Cut & Fold, by our artist friend, Hiroshi Hayakawa. it is a terrific book for the crafty and non-crafty alike, and for all age groups, too! Congratulations to Kat! This really sounds like such a great book! It really is a fascinating book, Mitch and Molly! 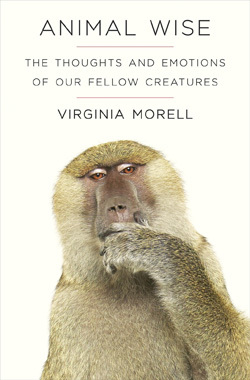 V. Morell is a super smart and gracious person...and a just plain terrific writer-you feel like you're traversing the jungles right behind her and Jane Goodall! Congratulations to the winner!! Lucky! Thank you so much! I'm super excited to read it!